If you love bacon for breakfast, you will love this Maple Bacon Lip balm all day long! This is bacon for your lips without all the calories. You get all the smokey sweet flavor that moisturizes the lips, but won’t feel greasy. If you love bacon for breakfast, you will love this Maple Bacon Lip balm all day long! This is bacon for your lips without all the calories. You get all the smokey sweet flavor that moisturizes the lips, but won’t feel greasy. 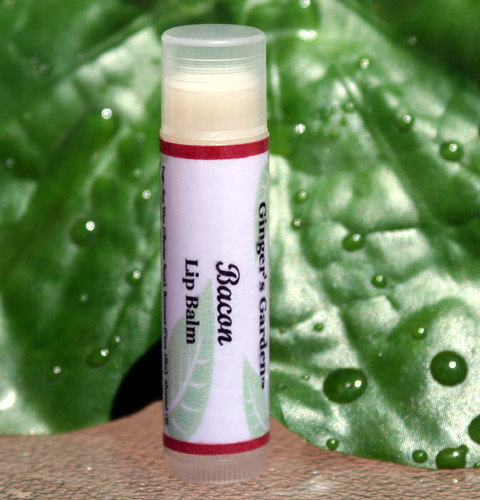 Carry this lip balm in your pocket or purse and enjoy the bacon flavor anytime. If you crave the taste, now you can indulge! This would make a perfect gift for that man that’s hard to buy for. Get one for your next BBQ or a picnic and be the life of the party. 0.2 ozs. In a swivel up lip tube. Ingr: Soy Wax (Glycine Soya), Beeswax (Cera Alba), Almond Oil (Prunus Dulcis), Coconut Oil (Cocos Nucifera), Jojoba (Simonsia Chinensis), Mango Butter (Mangifera Indica), Vit. E, Flavor, Sucralose.